With competition for coffee sales becoming increasingly competitive, bartlett mitchell, turned to the artisan coffee market for inspiration and used Fairtrade to boost sales. This case study was written by Lin Dickens, Marketing Director at bartlett mitchell for the Sustainable Restaurant Association’s ‘Good coffee’ campaign. Ever since they started the company, our founders Wendy Bartlett and Ian Mitchell have been passionate about having an ethical supply chain and that relates to everything we source. Ethical coffee has been a really important part of that philosophy and it explains why we’ve always served certified Fairtrade coffee. Then along came the boom in speciality and third generation coffee. Artisan cafés and coffee shops were opening up all over the place and our customers, like all discerning consumers, were becoming more questioning about what they were drinking. They wanted to know more about the coffee and these places were building a brand around a premium, great tasting product with a fantastic story – taking their customers even closer to the producer. Coffee is a very competitive sector and one that is growing and diversifying rapidly. We realised that, if we were going to compete, we’d have to emulate the approach of this new wave of coffee shops. So, in May 2015 I was tasked by our Sales Director, Simon Houston with finding the solution. I came up with a brief that majored on the three key things that we wanted: a truly delicious tasting coffee, with brilliantly roasted beans, from an ethical company. We’d been using our roaster Bewley’s for years and always admired their ethos. As a long established family owned company with Quaker roots, great connections with communities and awards for taste, I approached them with the brief. I wanted to be confident that we could talk about purchasing with purpose and have an authentic story to tell – premium coffee that could make a real impact. 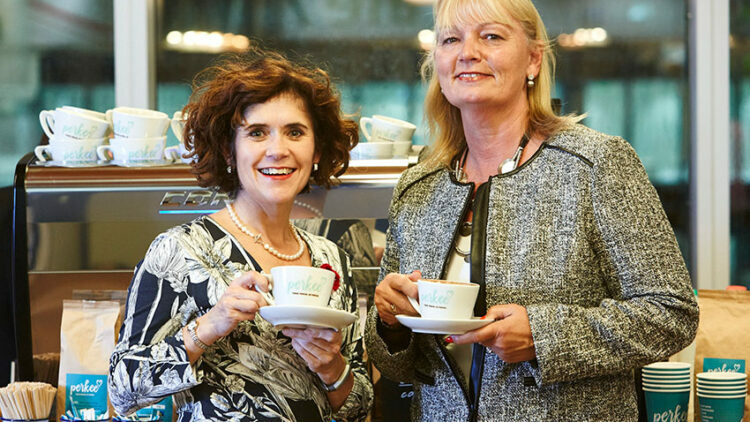 As a female entrepreneur, Wendy has always been passionate about women in business getting the credit they deserve, so when Bewley’s came back to us suggesting a female-run co-operative in Nicaragua we were really excited. They told us about how the Soppexcca Co-Op runs creches so the women who make up 40% of the workforce, can go to work and leave their children in a safe place. Soppexcca uses its profits for health care and education and to develop other enterprises in case the crop fails. But I knew that the story was only part of the brief; I had to be confident that we could build a brand around it and crucially that the coffee would taste great too. So I had to do two things; come up with a detailed and compelling branding brief and set up a tasting team. For the brand, I knew we were aiming at customers who wanted to purchase with purpose and we wanted to promote a rustic and artisan feel. We held brainstorming sessions to fix on a name for the coffee and came up with Perkee, reflecting the uplifting feel coffee gives and the boost from making a difference to the community. We then developed the strapline – Turn that frown upside down. I conducted market research with facilities managers and buyers and they fell in love with the story and they were adamant that this should be a really upfront message. With a story and a brand we had to guarantee the other key element – taste. So Simon pulled together a team of discerning tasters and they worked with Bewley’s honing and developing the roast until we came up with the final, great tasting product. Armed with a delicious, ethical single origin 100% Arabica coffee, there was one more thing we had to do to ensure we did it justice – training. So we appointed a coffee brand manager and every one of the sites that sells Perkee has to be trained. We now also have our own barista academy which all of our baristas attend. The benefits are clear for our clients too as we’re helping provide them with a measurable part of their CSR achievements.It’s been hugely positive for our staff too. We regularly ask our team what it’s like working for us. Our ethical approach always score highly and Perkee is a big part of that. We had a visit from one of the female farmers in March and in 2017 Wendy and I are going to visit Soppexcca and we’ll be able to further develop our personal relationship with the growers and find out face-to-face what more we can do together. Overall, it’s been a very smooth ride. Once we decided what it was we wanted to achieve and had the brief, everything else really has fallen into place. A key reason for that has been working with an experienced supplier like Bewley’s.